I can’t say enough about reading. Children need many opportunities to be read to and need to interact with books on a regular basis. Here is a link to an article about fostering literacy in young children. Children, especially toddlers, love to help out around the house. When my youngest turned two, she seemed ready to help with a variety of tasks such as sweeping the floors, dusting, “folding” clothes, washing the dishes, and putting the dishes away. These tasks provide many chances for learning! For example, a simple activity such as putting the dishes away is a fabulous opportunity to teach skills such as sorting and classification. I love watching my 2-year-old put the cutlery into the cutlery tray, and I am amazed at how quickly she mastered the skill of sorting the cutlery into their proper places. Toddlers can cook. I’ve written about the many benefits of cooking with children. The practical skills of following simple instructions, counting, and measuring are just a few of the concepts your toddler learns while engaged in baking activities. A good cookbook is always helpful too. I love the Kids Cook 1-2-3 cookbook because all the recipes are simple and use only three ingredients each. It’s perfect for a toddler! Children build important skills when allowed to dress themselves. I often provide my toddler with a variety of items to dress in when we’re not planning to go anywhere/do anything. Pants, shirts, socks, coats, and shoes… I place a pile in front of her and allow her as much time, freedom, and opportunity to explore dressing with these items. A picture schedule can be used to keep confidence high and frustration low! Not only does dressing provide the opportunity to learn vital self-help skills, but it also provides a platform to expand vocabulary and build fine motor skills. There are so many benefits to getting outdoors on a regular basis. Walks can fascinate little minds. From billowing clouds to chirping birds to looking in a puddle, toddlers benefit from getting outside and exploring the great outdoors. When I worked in childcare, I observed one of the most beneficial learning opportunities for toddlers is grocery shopping. A simple list, a basket (or child-sized cart) and the time to make the learning meaningful can have a remarkable impact on a toddler. Tell them which item you’re getting. Describe it to them and see if they can spot it. Encourage them put the item in the cart. Allow them to use a pen to cross the item off of the list. Let them help unload the cart. Encourage them to participate in paying for the groceries (self-checkouts are the best for this). Lastly, when you get home, they can help put the groceries away. 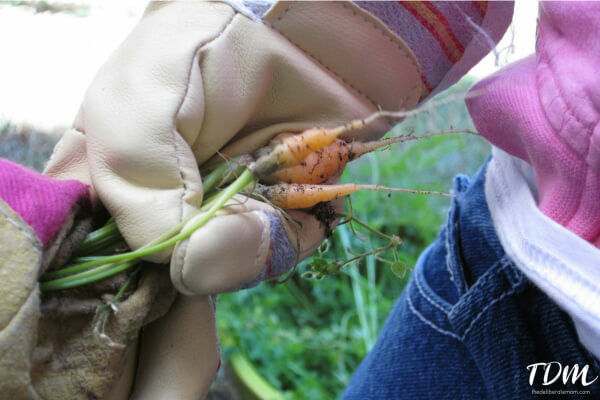 Gardening is another hands-on, real life activity for toddlers. The cause and effect of planting a seed, watering it, and observing it grow are wonderfully captivating for young children. Make sure to choose easy-to-grow plants (herbs and beans are some of our favourites around here). Children (especially toddlers) love “real” materials. Let your toddler interact with real bowls, a real (non-operational phone), and a calculator. The exposure to these items stimulates their minds (especially if it has a cause and effect aspect, like when they push the buttons on a calculator they can see the numbers on the screen). Children learn so much from interacting with others. Community walks, excursions to your local library, and even dinner at a nearby restaurant provides a wealth of opportunities for your child to learn and grow. Their interactions with others and the sights they see help build a foundation for understanding that they are a part of something bigger than just their family and their home. Speaking with your toddler, much like reading, provides a wonderful learning opportunity. When speaking with a toddler, never correct his/her language. If he/she pronounces something wrong, simply parrot what they’ve said with the correct pronunciation of the word. I hope that these ideas inspire and motivate you to see the rich learning opportunities available to children simply by engaging them in real and meaningful experiences. 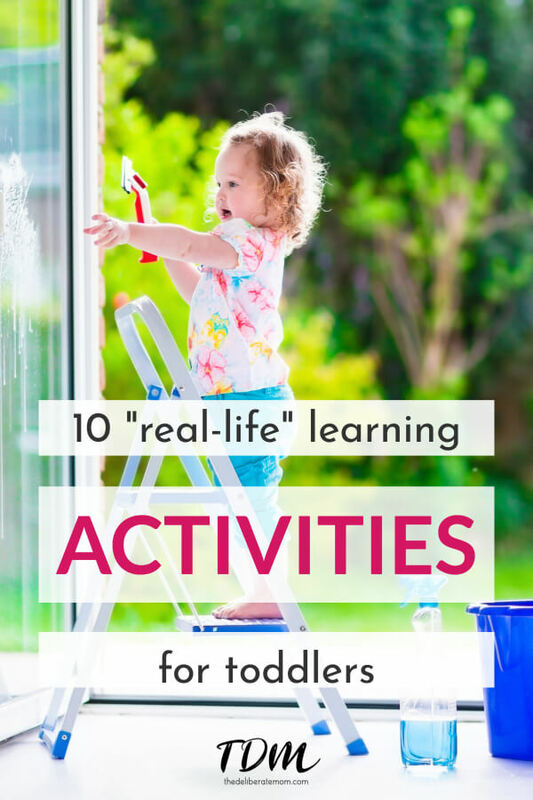 Do you have anything you would add to the “real” learning activities list? I love that you included cooking! Too many parents think that cooking is out of reach for a toddler. Can’t wait to check out that cookbook! Cooking is huge here! I started cooking with my girls when they we both wee toddlers. They catch on quickly! Sweet! I’ve been doing all of these with my kids and I didn’t even know I was following a philosophy! I’ve just been doing what my Mom did. :) Grocery shopping is a favourite activity of ours too! I have the kids help put produce in the bags and we count them together (one potato, two potatoes). They also love helping put everything on the conveyor belt for scanning. Even my 14 month old loves putting stuff on the belt. He gets so proud! Cooking together is something we’ve always done too. I think is fosters a wonderful connection between kids and food and definitely develops a ton of skills! (my three year old cracked an egg on her own last week!) Great list! Shilo – so thrilled to hear how you naturally did these things with your children! Sounds like you had a pretty awesome mama. Cooking is she an awesome activity for young children. Way to go! Really good tips! One thing I look forward to for when we have kids is teaching them how to cook. I want to get them started young helping out in the kitchen! Tammy – Children love helping in the kitchen and you have such a lovely piece of land, I’m sure there will be many “real” learning experiences for your little ones! These are all great ideas! I’m not surprised considering this is your area of expertise, but wow! I will be incorporating these suggestions in my approach toward teaching Dylan. Thanks for sharing, it’s incredible what I learn from you in your blog. Oh and the photo of the socks, lol. CLASSIC! Awww, thank Becky! I’m glad you will find these suggestions useful. I love her attempts at putting on socks… always makes me laugh! My son is 4 years old, and he love to help me doing the chores house, even when I am baking he says “I will help you, I do it” I just love those words. It’s lovely that they’re so eager to help! We have to savour it because I heard a rumor that they’re not as helpful in the teen years! These are all great ideas. I’m going to pick up the grocery shopping one next week. My kids will love that. Thank you! I love our small “learning” grocery trips! There’s so much that they can help with and do. I would love to hear how it went for you! Thanks Susannah! Children love the day-to-day activities and they get such confidence from practicing these “grown-up” skills. Glad you liked these tips Tiffany! Try her out with a few “smaller” trips and then you can incorporate her helping with the bigger trips. Grocery shopping is a phenomenal learning activity! I happen to love the backward socks. Awesomesauce. Yes, I love those little backward socks! Too funny! I hate to sound the odd one here. I have never ever let my kids help me cook. (they are NO TODDLERS) so I am going to pick it up from here. Children usually love to help cook. I would love to know how it goes when you try it out with your children! Those are really all great tips. I currently encourage to Madison to dress herself and help in the kitchen, within reason of course. It really builds her confidence as well and I love that bonding time that we share when we do things together. Thanks Amanda! It sounds like you’re doing some great things with Madison. Good for you! Seriously love this. My 3 year old is totally more interested in helping me with the laundry than playing with his toys. He loves to do “real” things. I hadn’t thought to let him sort the dishes, he would love that! Wonderful! I’m sure he would love to help you more! They learn so much from these tasks! Great ideas! For the last one you said don’t correct them but instead parrot back what they said? I’m a little confused. Does that mean for example my toddler said pees for please so I repeat back pees? Or say please back showing him the correct pronounounciation? (Without saying “no, it’s please)? Is that what you mean? I love the idea of letting little ones do chores and dress themselves. I love this! I have to admit, there are a few of these things that I don’t really let my kids do.. but I should totally start!